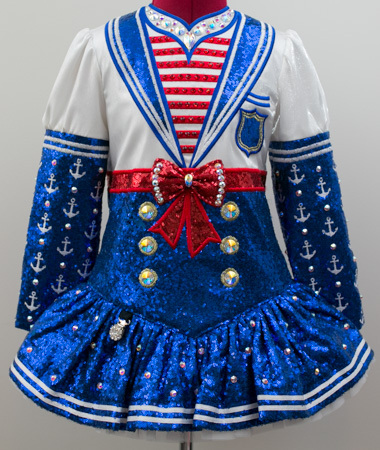 Dropped waist at seam: 30½"
Centre back dropped waist to hem: 8¼"
Sailor themed costume, constructed from royal blue sequin with white twinkle satin faux bolero style jacket, with red, white and gold embroidery and adorable red sequin bow in centre front. 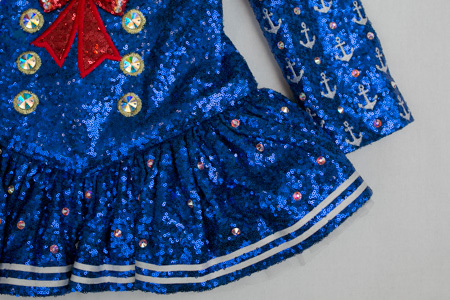 Matching royal blue sequin skater skirt with white ribbon trim. 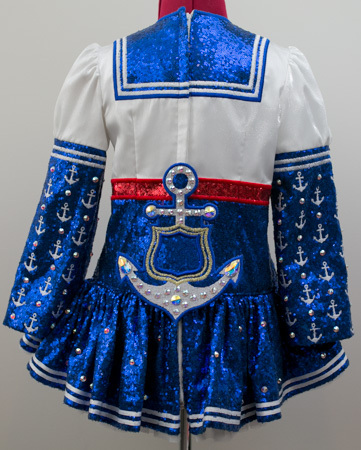 Lower sleves feature adorable white embroidered anchors, the shawl is in the shape of a matching larger anchor. The bodice is fully lined and the underskirt is lined in a blue cotton. Excellent condition. Worn 5 times only.